I am not sure of GMA knows how to do this, so let me teach them how. In “An Analysis of Rappler’s ‘Rodrigo Duterte’s 386 P. Guevarra Property”, I showed how failing to get the other side of the story results in cataclysmic levels of misinformation. In this article, I explained how the sorority blog Rappler came up with a conspiracy theory based solely on a document from an unidentified source, when it could’ve easily been counter-checked with a simple phone call to the Duterte camp. But that’s Rappler: my expectations are not very high. But I did not expect the three-decade-old Philippine Daily Inquirer to do the same thing. The Duterte Government awarded contracts without following procurement laws. The article, at face value, is pretty damning for the Duterte-led National Government. Why would someone who won on an anti-corruption platform award contracts to companies with dubious reputations and in contravention with procurement laws? But there’s a catch: the Inquirer did not contact the government before they published this article. That is, the Inquirer did not bother to ask anyone from the government about this prior to the article’s publication. This is confusing for regular Filipinos like me, considering that they have correspondents in the Malacañang Press Corps. The Inquirer even has direct access to Presidential Communication Operations Office Secretary Martin Andanar, who writes a column for them. As it turns out, the article fell flat on its face after the government commented about the issues. 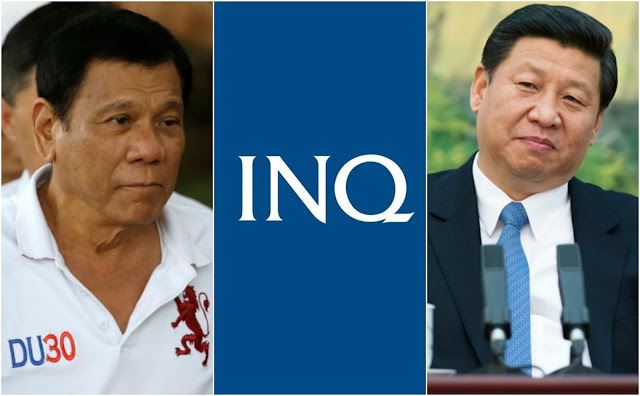 Two days later on 27 October 2016, Inquirer’s Dizon published a follow-up article entitled “Just memos, contract, with Chinese firm, says BCDA [Inq]”, where BCDA said the documents signed in Beijing were just MoU’s, or Memorandums of Understanding between the Chinese Companies and their Philippine counterparts. BCDA Chief Vince Dizon (no relation to the Inquirer reporter) even castigated the Inquirer for neglecting to counter-check its October 25 story. He also said that MoUs are by no means an award of contract. According to the The Law Society of Singapore, “an MoU is generally considered ‘an agreement to agree’ or an agreement to enter into a more specific and comprehensive contract or agreement at a later time after further negotiations”. Furthermore, “MOUs are expressed to be not contractually binding. This is because the courts will generally not recognize agreements to enter into contracts, as contracts in their own right [LSSG]”. In short, MoU do not violate procurement laws because they simply are generic agreements to cooperate. MoU’s do not set up the specific terms of a project contract (e.g. specific project cost), terms that are necessary for the government to award project contract. Nikko Dizon’s article would have had a drastically less accusatory tone had the reporter bothered to ask the government about it... but she didn’t. In short, iyong sinulat ni Nikko na October 25 article ay pambalot lang ng tinapa and nothing more. Fair enough, I think. But then, if Nikko Dizon was so good at research, why did she miss reading the actual MoU’s? Surely, an organization as well-funded as hers should be able to get hold of such. It appears that her secret may be Facebook. On 23 October 2016 or two days prior to Dizon’s first article, a certain “Luis Abad” published three consecutive publicly-visible Facebook status posts [FB1, FB2, FB3] that listed issues regarding the Chinese companies involved in the $24 billion worth of investment pledges that the Duterte Government helped snag in its recent State Visit to Beijing China. 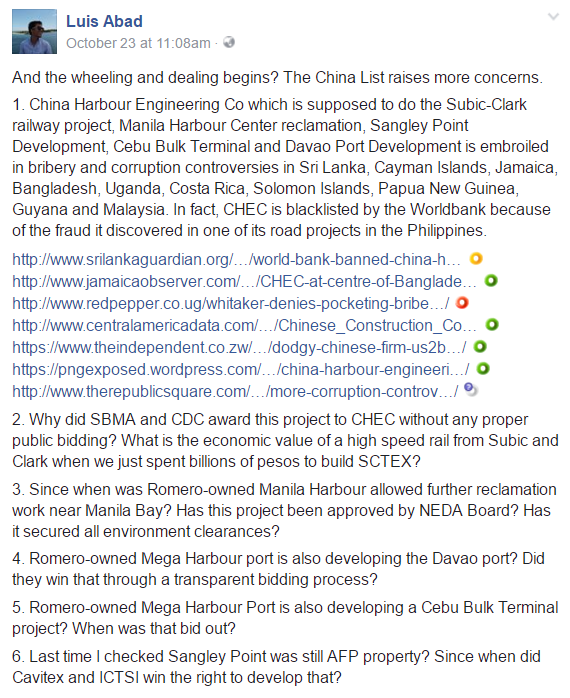 Subic Bay Metropolitan Authority (SBMA) may have awarded a contract to China Harbour Engineering Co (CHEC) despite the latter’s involvement in bribery and corruption controversies in 10 countries, and its being blacklisted by the World Bank. Romero-owned Manila Harbour may have been allowed to do further reclamation work on Manila Bay despite lack of NEDA and DENR approval. Romero-owned Mega Harbour Port and Development Inc may have flouted procurement laws when it was allowed to develop the Davao and Cebu ports. Cavitex and ICTSI may have been illegally allowed to develop Sangley Point, which is still AFP property. Two Chinese companies – China Road and Bridge Corp (CRBC) and Yangtse Motor Group – may have been awarded transportation-related contracts without proper bidding, and that CRBC was involved in bribery and corruption controversies in four countries. Sinotech has also been involved in bribery and corruption issues. Zonar Systems was also cited, but only in light of the absence of readily-available information regarding the bidding processes. This is pretty long list. But to sum it all up, Abad’s questions revolve around two things: (1) regulatory compliance on the bidding process and (2) dubious company reputations. This sounds awfully similar to the Dizons’s article, which revolves around the same two core issues. Nikko Dizon’s failure to ask for BCDA’s position might be a classic case of journalistic incompetence, i.e. it was an honest accident. However, Dizon is an experienced reporter who must be very aware of allegations of bias against the Inquirer so she should’ve taken every step to dispel that notion. For a Pasig River Project, Zonar Systems was mentioned along with Sinohydro. CAMC engineering was the only company mentioned in the Inquirer article that did not appear in any of Abad’s three posts. Such a detailed Inquirer article could not have matched those posts by pure coincidence. I am not accusing Dizon of plagiarism but I am confused as to why Dizon would pick up such leads without counter-checking when her likely source is a Liberal Party Stalwart. Luis Abad’s father is former Aquino Budget Secretary Florencio “Butch” Abad, his mother is Liberal Party Vice President for Policy Henedina Abad, and he also was the former chief of staff of Aquino’s Finance Secretary Cesar Purisima [OGP]. So why didn’t the Inquirer’s Dizon get the other side? Is she a Liberal Party loyalist herself? Truth be told, I am disturbed about how such a story can get past the lower-tier Inquirer editors, but I am not surprised that it got past Inquirer.net Editor-in-Chief John Nery [Nery]. Why? Because Nery appears to have actively defended Senator Leila de Lima of the Liberal Party [LATimes], and because he allowed the creation, publication, and the continuous expansion of the journalistic travesty that is the Inquirer’s “Kill List”[TP: Kill List]. I think the conflict of interest here is economic in nature, as the Inquirer’s owners have a score to settle with President Duterte. First, Benjamin Philip Romualdez, husband of Inquirer heiress Sandy Prieto [TV5], is the president of the Chamber of Mines [CoM], and we all know Duterte’s crackdown on illegal mining operators [Inq]. Second, Dennis Valdes, husband of another Inquirer heiress Tessa Prieto [Pep], was the president of PhilWeb when Duterte’s refusal to renew Philweb’s contract resulted into its closure [Star]. Yes, we are talking about billions of pesos' worth of potential (or realized) economic losses for the Rufino-Prietos as a result of Duterte's pro-people policies.